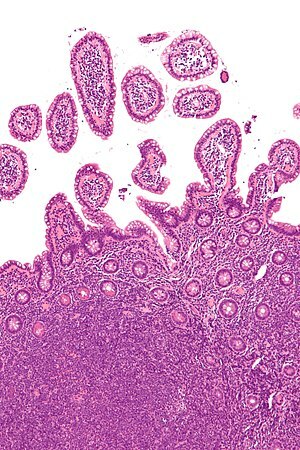 Micrograph of mantle cell lymphoma, a type of non-Hodgkin lymphoma. Terminal ileum. H&E stain. Non-Hodgkin lymphoma (NHL) is a group of blood cancers that includes all types of lymphoma except Hodgkin's lymphomas. Symptoms include enlarged lymph nodes, fever, night sweats, weight loss and tiredness. Other symptoms may include bone pain, chest pain or itchiness. Some forms are slow-growing, while others are fast-growing. Lymphomas are types of cancer that develop from lymphocytes, a type of white blood cell. Risk factors include poor immune function, autoimmune diseases, Helicobacter pylori infection, hepatitis C, obesity and Epstein-Barr virus infection. The World Health Organization (WHO) classifies lymphomas into five major groups, including one for Hodgkin's lymphoma. Within the four groups for NHL, there are over 60 specific types of lymphoma. Diagnosis is by examination of a bone marrow or lymph node biopsy. Medical imaging is done to help with cancer staging. Treatment depends on whether the lymphoma is slow- or fast-growing and if it is in one area or many areas. Treatments may include chemotherapy, radiation, immunotherapy, targeted therapy, stem cell transplantation, surgery or watchful waiting. If the blood becomes overly thick due to high numbers of antibodies, plasmapheresis may be used. Radiation and some chemotherapy, however, increase the risk of other cancers, heart disease or nerve problems over the subsequent decades. In 2015, about 4.3 million people had non-Hodgkin lymphoma, and 231,400 died. In the United States, 2.1% of people are affected at some point in their life. The most common age of diagnosis is between 65 and 75 years old. The five-year survival rate in the United States is 71%. Some chemicals, like polychlorinated biphenyls (PCBs), diphenylhydantoin, dioxin, and phenoxy herbicides. Autoimmune diseases, like Sjögren’s syndrome, celiac disease, rheumatoid arthritis, and systemic lupus erythematosus. Familial lymphoid cancer is rare. The familial risk of lymphoma is elevated for multiple lymphoma subtypes, suggesting a shared genetic cause. However, a family history of a specific subtype is most strongly associated with risk for that subtype, indicating that these genetic factors are subtype-specific. Genome-wide association studies (GWAS) have successfully identified 67 single nucleotide polymorphisms (SNPs) from 41 loci, most of which are subtype specific. The Center for Disease Control and Prevention (CDC) included certain types of non-Hodgkin's lymphoma as AIDS-defining cancers in 1987. Immune suppression rather than HIV itself is implicated in the pathogenesis of this malignancy, with a clear correlation between the degree of immune suppression and the risk of developing NHL. Additionally, other retroviruses such as HTLV may be spread by the same mechanisms that spread HIV, leading to an increased rate of co-infection. The natural history of HIV infection has been greatly changed over time. As a consequence, rates of non-Hodgkin's lymphoma (NHL) in people infected with HIV has significantly declined in recent years. The traditional treatment of NHL includes chemotherapy and stem cell transplants. The most common chemotherapy used for B-cell non-Hodgkin lymphoma is R-CHOP, which is a regiment of four drugs (cyclophosphamide, doxorubicin, vincristine, and prednisone plus rituximab). There have been developments in immunotherapy. Bendamustine is also used. Globally, as of 2010, there were 210,000 deaths, up from 143,000 in 1990. Rates of Non-Hodgkin lymphoma increases steadily with age. Up to 45 years NHL is more common among males than females. In the US, data from 2007–2011 show that there were about 19.7 cases of NHL per 100,000 adults per year, 6.3 deaths per 100,000 adults per year. About 2.1 percent of men and women are diagnosed with NHL at some point during their lifetime, and there were around 530,919 people living with non-Hodgkin lymphoma. American Cancer Society lists Non-Hodgkin lymphoma as one of the most common cancers in the United States, accounting for about 4% of all cancers. In Canada, NHL is the fifth most common cancer in males and sixth most common cancer in females. The lifetime probability of developing a lymphoid cancer is 1 in 44 for males, and 1 in 51 for females. NHL is the sixth most common cancer in the UK (around 12,800 people were diagnosed with the disease in 2011), and it is the eleventh most common cause of cancer death (around 4,700 people died in 2012). While consensus was rapidly reached on the classification of Hodgkin lymphoma, there remained a large group of very different diseases requiring further classification. The Rappaport classification, proposed by Henry Rappaport in 1956 and 1966, became the first widely accepted classification of lymphomas other than Hodgkin. Following its publication in 1982, the Working Formulation became the standard classification for this group of diseases. It introduced the term non-Hodgkin lymphoma or NHL and defined three grades of lymphoma. NHL consists of many different conditions that have little in common with each other. They are grouped by their aggressiveness. Less aggressive non-Hodgkin lymphomas are compatible with a long survival while more aggressive non-Hodgkin lymphomas can be rapidly fatal without treatment. Without further narrowing, the label is of limited usefulness for patients or doctors. The subtypes of lymphoma are listed there. Nevertheless, the Working Formulation and the NHL category continue to be used by many. To this day, lymphoma statistics are compiled as Hodgkin's versus non-Hodgkin lymphomas by major cancer agencies, including the US National Cancer Institute in its SEER program, the Canadian Cancer Society and the IARC. ^ a b c d e f g h i j k l m n o p "Adult Non-Hodgkin Lymphoma Treatment (PDQ®)–Patient Version". NCI. August 3, 2016. Archived from the original on 16 August 2016. Retrieved 13 August 2016. ^ a b c d e f "SEER Stat Fact Sheets: Non-Hodgkin Lymphoma". NCI. April 2016. Archived from the original on 6 July 2014. Retrieved 13 August 2016. ^ a b World Cancer Report 2014. World Health Organization. 2014. pp. Chapter 2.4, 2.6. ISBN 978-9283204299. ^ a b GBD 2015 Disease and Injury Incidence and Prevalence, Collaborators. (8 October 2016). "Global, regional, and national incidence, prevalence, and years lived with disability for 310 diseases and injuries, 1990–2015: a systematic analysis for the Global Burden of Disease Study 2015". Lancet. 388 (10053): 1545–1602. doi:10.1016/S0140-6736(16)31678-6. PMC 5055577. PMID 27733282. ^ "Adult Non-Hodgkin Lymphoma Treatment (PDQ®)–Health Professional Version". NCI. June 1, 2016. Archived from the original on 12 August 2016. Retrieved 13 August 2016. ^ "Different types of non Hodgkin lymphoma". Cancer Research UK. Archived from the original on 14 August 2016. Retrieved 13 August 2016. ^ Bope, Edward T.; Kellerman, Rick D. (2015). Conn's Current Therapy 2016. Elsevier Health Sciences. p. 878. ISBN 9780323355353. Archived from the original on 2017-09-10. ^ Maeda E, Akahane M, Kiryu S, Kato N, Yoshikawa T, Hayashi N, Aoki S, Minami M, Uozaki H, Fukayama M, Ohtomo K (2009). "Spectrum of Epstein-Barr virus-related diseases: A pictorial review". Japanese Journal of Radiology. 27 (1): 4–19. doi:10.1007/s11604-008-0291-2. PMID 19373526. ^ Peveling-Oberhag J, Arcaini L, Hansmann ML, Zeuzem S (2013). "Hepatitis C-associated B-cell non-Hodgkin lymphomas. Epidemiology, molecular signature and clinical management". Journal of Hepatology. 59 (1): 169–177. doi:10.1016/j.jhep.2013.03.018. PMID 23542089. ^ a b Pinzone MR, Fiorica F, Di Rosa M, Malaguarnera G, Malaguarnera L, Cacopardo B, Zanghì G, Nunnari G (October 2012). "Non-AIDS-defining cancers among HIV-infected people". Eur Rev Med Pharmacol Sci. 16 (10): 1377–88. PMID 23104654. ^ Kramer S, Hikel SM, Adams K, Hinds D, Moon K (2012). "Current Status of the Epidemiologic Evidence Linking Polychlorinated Biphenyls and Non-Hodgkin Lymphoma, and the Role of Immune Dysregulation". Environmental Health Perspectives. 120 (8): 1067–75. doi:10.1289/ehp.1104652. PMC 3440083. PMID 22552995. ^ Zani C, Toninelli G, Filisetti B, Donato F (2013). "Polychlorinated biphenyls and cancer: an epidemiological assessment". J Environ Sci Health C Environ Carcinog Ecotoxicol Rev. 31 (2): 99–144. doi:10.1080/10590501.2013.782174. PMID 23672403. ^ Lauby-Secretan B, Loomis D, Grosse Y, El Ghissassi F, Bouvard V, Benbrahim-Tallaa L, Guha N, Baan R, Mattock H, Straif K (2013). "Carcinogenicity of polychlorinated biphenyls and polybrominated biphenyls". Lancet Oncology. 14 (4): 287–288. doi:10.1016/s1470-2045(13)70104-9. PMID 23499544. ^ a b Tobias, J; Hochhauser D. (2015). Cancer and its Management (7th ed.). Wiley-Blackwell. ISBN 9781118468715. ^ Arnold S Freedman, Lee M Nadler (2000). "Chapter 130: Non–Hodgkin's Lymphomas". In Kufe DW, Pollock RE, Weichselbaum RR, Bast RC Jr, Gansler TS, Holland JF, Frei E III (eds.). Holland-Frei Cancer Medicine (5th ed.). Hamilton, Ont: B.C. Decker. ISBN 1-55009-113-1. Archived from the original on 2017-09-10. ^ Cerhan, James (Nov 12, 2015). "Familial predisposition and genetic risk factors for lymphoma". Blood. 126 (20): 2267-2273. doi:10.1182/blood-2015-04-537498. PMC 4643002. PMID 26405224. ^ "Revision of the CDC surveillance case definition for acquired immunodeficiency syndrome. Council of State and Territorial Epidemiologists; AIDS Program, Center for Infectious Diseases" (PDF). Morbidity and Mortality Weekly Report. 36 (Suppl 1): 1S–15S. 1987. PMID 3039334. Archived (PDF) from the original on 2017-06-09. ^ Lee, Belinda; Bower, Mark; Newsom-Davis, Thomas; Nelson, Mark (2010). "HIV-related lymphoma". HIV Therapy. 4 (6): 649–659. doi:10.2217/hiv.10.54. ^ "Treating B-Cell Non-Hodgkin Lymphoma". www.cancer.org. Retrieved 2019-02-05. ^ Lozano R, Naghavi M, Foreman K, Lim S, Shibuya K, Aboyans V, Abraham J, Adair T, Aggarwal R, Ahn SY, et al. (Dec 15, 2012). "Global and regional mortality from 235 causes of death for 20 age groups in 1990 and 2010: a systematic analysis for the Global Burden of Disease Study 2010". Lancet. 380 (9859): 2095–128. doi:10.1016/S0140-6736(12)61728-0. PMID 23245604. ^ Bleyer, W Archie, Barr, Ronald D. Cancer in Adolescents and Young Adults. Springer, 2007, p. 129. ^ "What Are the Key Statistics About Non-Hodgkin Lymphoma?". www.cancer.org. Retrieved 2018-01-05. ^ "Canadian Cancer Statistics". www.cancer.ca. Retrieved 2018-02-08. ^ "Non-hodgkin lymphoma statistics". Cancer Research UK. Archived from the original on 7 October 2014. Retrieved 28 October 2014.